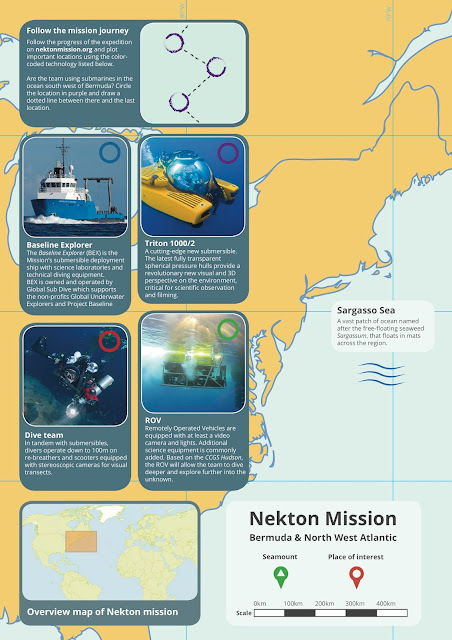 Explorers of the deep ocean Nekton who have been exploring Bermuda’s sea bed have produced a 360 degree virtual reality video that allows viewers to experience a virtual submersible dive to the deepest point of the world’s ocean. The film shows footage of Challenger Deep which is located 6.83 miles under the Pacific Ocean in the Mariana Trench. The video’s release marks the launch of Nekton’s first mission, sponsored by re/insurer XL Catlin, to investigate the condition of the deep ocean. The findings will be released as part of the XL Catlin Deep Ocean Survey, a multidisciplinary marine research program investigating physical, chemical and biological indicators to assess the function, health and resilience of the deep ocean. Scientists from a dozen marine research institutes are joining the four-week mission launched by the newly founded scientific research charity, Nekton. The research program, based aboard two sea going vessels, is focusing on Bermuda, Nova Scotia, and the High Seas (north west Atlantic and the Sargasso Sea). Nekton’s co-founder and submersible pilot, Oliver Steeds, who narrates the descent, said: “Whilst 12 people have walked on the moon, only three people have been to full ocean depth. “People have spent 300 hours on the moon and only three hours at full ocean depth. Viewers will experience the descent into the darkest depths of the ocean, and encounter the inhabitants and hundreds of facts about the least known frontier on our planet. The 10 minute video, Journey to the Deep, is divided into three episodes to be released over the course of the mission. The first episode takes the viewer from the surface into the Twilight Zone (200m-1000m); the second explores the Midnight & Abyssal Zones (1000m-6000m); the third descends into the Hadopelagic Zone (6000m-11000m). The videos can be viewed online at the Nekton Mission YouTube Channel and Facebook page via a smartphone and virtual reality headset or via tablet and computer using keystrokes to move through a 360 degree line of sight. The Nekton team, in partnership with XL Catlin and Digital Explorer, has also developed an educational programme to support the mission, including a series of science challenges where students can earn Mission Badges, with a special Submarine Explorer certificate awarded when all six are completed. Targeting eight to 14-year-olds, the resources support the Submarine STEM (Science, Technology, Engineering & Maths) initiative which aims to inspire STEM learning and young people’s environmental engagement. All the digital resources are available online so that children can access the materials via their PC, tablet and smartphone at home.